$525,000 USD Low than the market! 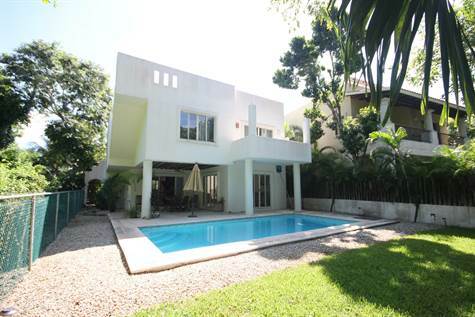 This fabulous 3 bedroom villa with a private pool is located in Playacar Phase 2, inside the Club Real residential, the property features a big garden on the back of the house with a pool, There bedrooms are located on the upper floor, all of them with balconies, closets, fans. The Master bedroom has a walking closet and a big bathroom. Downstairs you will be able to find a big living room with view of the pool and garden, a dining area, a fully equipped kitchen and a laundry room. There is an outdoor terrace with chairs and table where you can also enjoy the view of the pool. The house comes fully furnished! !